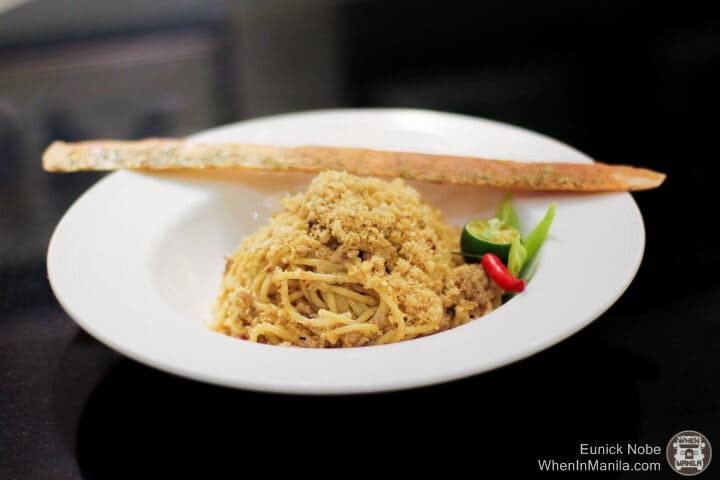 Mesclun is full of magic once again, featuring one of our favorites, the Sisig Spaghetti plus a wide array of old and new favorite dishes that will make us think of home. We know Mesclun as a venture that serves fine food at gatherings and events. It was originally situated in Linden Suites, Ortigas, but has re-opened its doors co-branding with Aruga Cafe in Rockwell, Makati. Mesclun is a French word that means ‘mixture’, and that basically explains the set of dishes they cater to: a collaboration of different cuisines. Chef Katrina Kuhn-Alcantara adds that Aruga Cafe by Mesclun was inspired by global tastes and is all about experiences. I’m guilty of being the first to take out my camera because I wanted to capture the presentation before taking a good sip of this French staple. 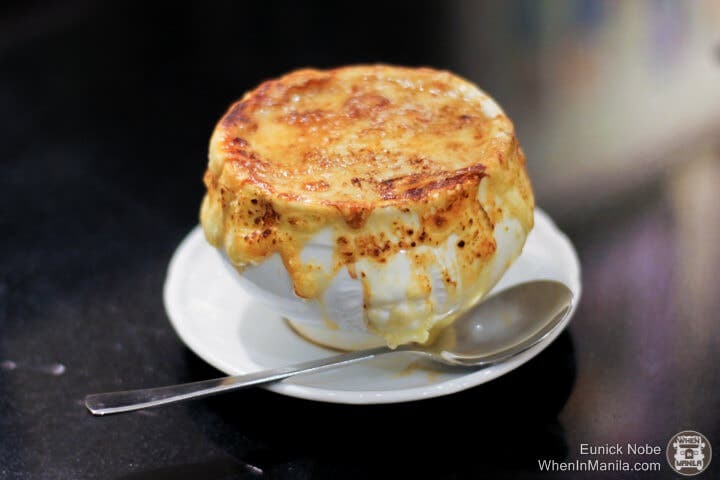 This one’s made with caramelized onions, a beef broth, gruyere and Emmental cheese. Just imagine this goodness warming up your tummy! When I looked at the menu, my eyes went big upon seeing ‘Sisig Spaghetti’ on the list. I even asked out loud, “Sisig Spaghetti?” Chef Kat confirmed that, yes, I read that right! This pasta is one of the chef’s favorites. It is mainly made from pork sisig and has a light cream sauce with chicharon bits. What makes it extra lovely, though, is the spiciness that you can ask to be added to it. 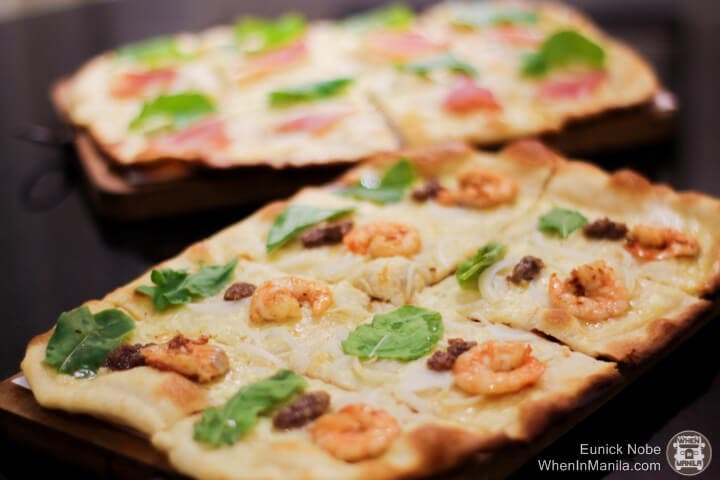 Aruga Cafe also serves four variants of Alsatian-style flatbread pizzas with homemade crème fraiche namely, Bacon (Php325), Shrimps and Anchovies (Php375), Mushroom and Swiss (Php375) and Parma Ham (Php395). We tried two of them and have to say that each one has its own unique and exquisite flavor on its thin crusts. We couldn’t help but ask for more! This is not your typical adobo because it has with guava served with rice pilaf. The sauce is rich with the flavor of our favorite adobo – a pinch of sweetness balanced with umami, sourness and salty taste. One of Aruga Cafe’s stars, Wagyu Rump Steak will help you taste a bit of Japanese, American, and maybe even more! This charcoal-grilled Margaret River Farms Wagyu rump is served with chimichurri, demi-glace mustard horseradish gravy and of course, mashed potatoes. 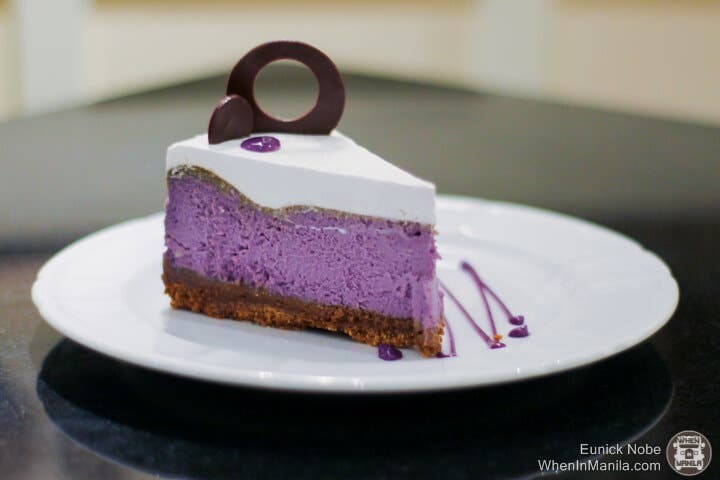 For those who love to dig into something sweet after a meal, even when our tummies are already full, Aruga Cafe’s signature cake, the Ube Cheesecake, will win your hearts! It’s light, creamy and has the perfect amount of sweetness. Aruga Cafe also serves coffee, beer, and cocktails for late night dates or just a quaint dinner if you happen to pass by Makati.